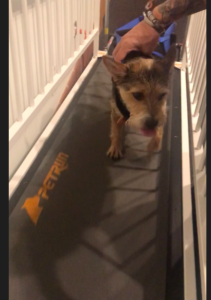 Duke pulling weight on n incline treadmill for hind leg and core strengthening. Duke is a 6 year old terrier mix who loves to fetch! a few weeks ago, he played a little too hard and came up lame. His owner was worried he tore his CCL. 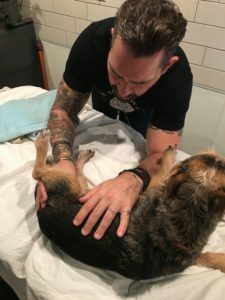 His vet had advised surgery and Duke’s owner wanted to see if conservative treatment could help. After my initial evaluation, I advised her that Duke didn’t seem to have a tear in his knee. Duke getting soft tissue work to his adductors. It was evident that he strained his low back and has had chronic weakness of his left knee which needs to be addressed. Since therapy has begun, Duke is only limping occasionally. He is much more active and playing like his old self again! 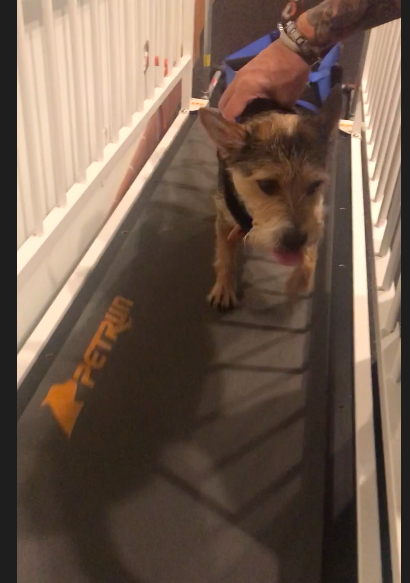 We are continuing therapy to address his continued lumbar muscle tightness and left hind leg weakness. Go Duke!